I look forward to the days when Mazen and I can cook together (and when he can cook for me! Ha!) In the meantime, we’ve started to get him a little more acquainted with the kitchen. 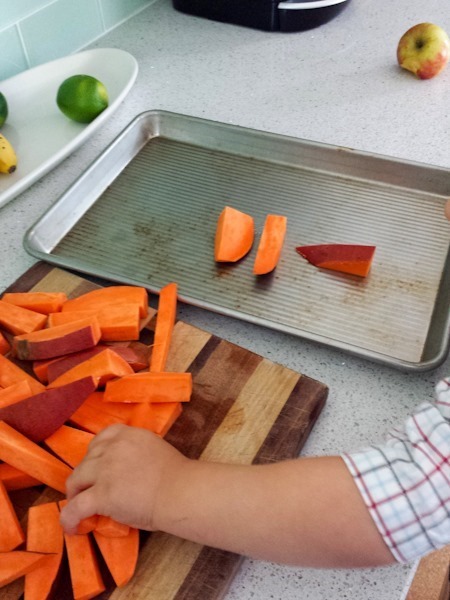 There are whole sites out there dedicated to ideas for kids and kitchens. Here are simply four small moments I captured. Moving cut potatoes from the board to the tray. He loved this “game” and the knife was far away. Salad spinning GO GO GO! Then we eat the lettuce. And by eat I mean he tries it (a start!) and then spits out most of it. So cute!!! I gave Drake a piece of kale the other night & he gave me the “look”! 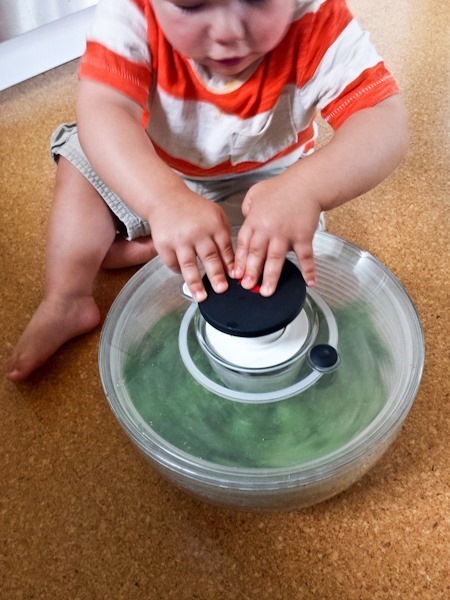 Aiden loves the salad spinner at 14 months too! I can’t wait for him to be able to do those things. Right now, I take out a pot and wooden spoon and have him “cook” while I’m cooking too. Ha, the salad spinner was my favorite “toy” as a kid. Poor Mazen’s cheeks look rashy, is he ok? I let my little one put chopped things into bowls and trays too. She loves it! 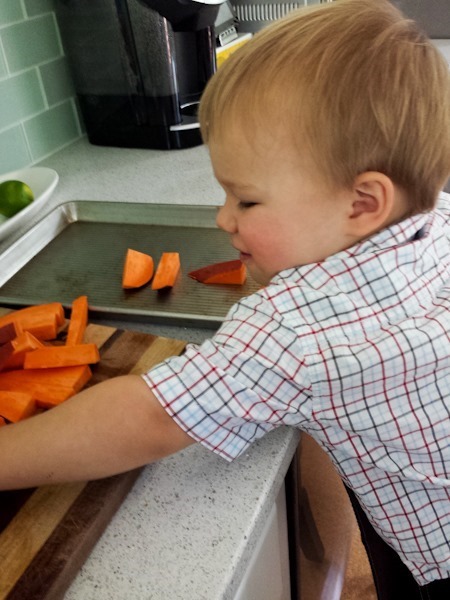 I actually hate being in the kitchen, but cooking with a little one makes it more enjoyable for sure! Adorable. 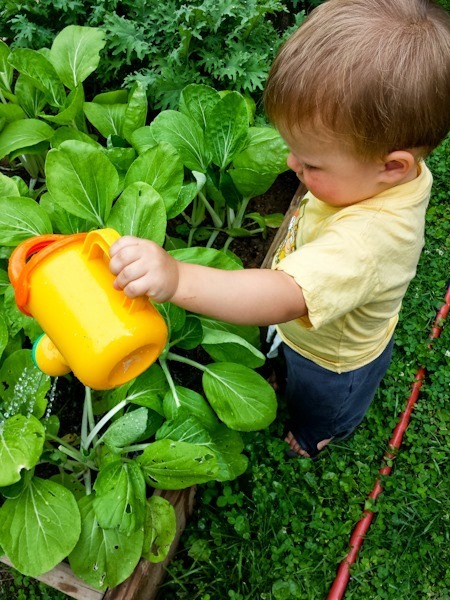 Great ideas for me to try with my 2.5 yr old. Although mixing “gently” NEVER happens and whatever he is mixing ends up everywhere! Haha. Hi Kath! Good thing you overstated the obvious by telling us the knife was far away! So tired of people jumping on you behind the safety of their screens. Anyone who has read you for as long as I have, five years, knows what a loving, responsible mother you are. I don’t know how you do it sometimes. Mazen is adorable! Kath I love that baking tray – can you remember where it is from? Thanks! My daughter has always loved helping in the kitchen too. 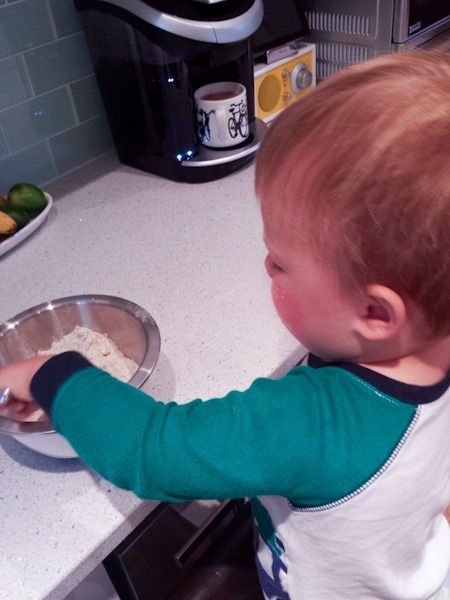 I think two of her early favorites were “kneading” dough and mixing granola with her hands. She loved all the different tastes and textures. She’s about to turn 3 now and is so proud of all the things she can do in the kitchen. My son is almost 1 year and I’m curious to see if he’ll be equally interested and willing to learn things like GENTLE stirring. Fun stuff!